Wanna hear a juicy story? The Queen of the night graces our flat ever more rarely with her presence, and when she does, it’s normally at such hours of the day that Blenderman and I barely notice. Normally we only realise she has even been home because she’s left something or other in the house that hints at her presence – generally dirty dishes in the sink, a lifetime supply of strawberry flavoured yoghurt in the fridge, or possibly a load of freshly washed laundry on the airer. Last month was different. She physically appeared in the kitchen with something way more exciting than a lifetime supply of yoghurt: she’d bought a juicer! It was to have its new home in the kitchen. The juicer was more than welcome in our modest household, and Blenderman and I promised to take very good care of it. It was a bit scary at first (there’s a lot of separate pieces to assemble), but once you get used to it, a juicer is just about the coolest thing you could have in your kitchen. 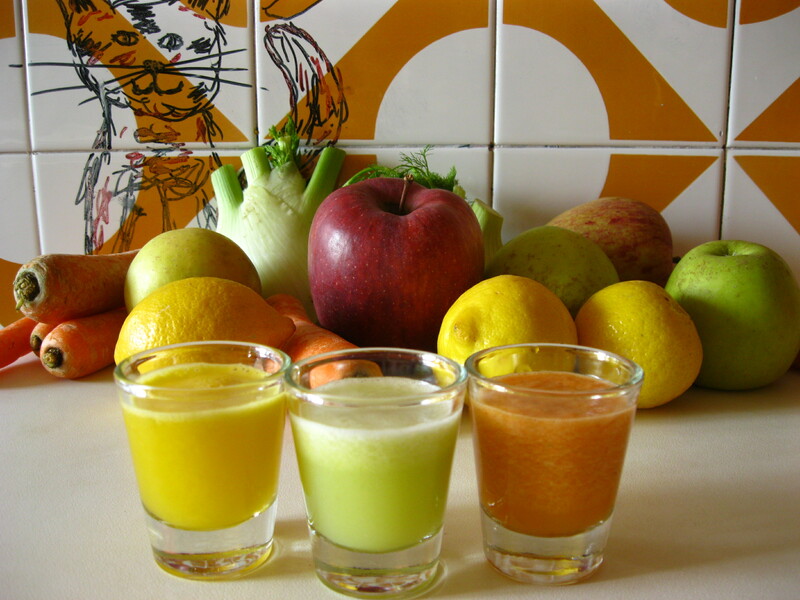 Fresh fruit juice is just the best thing ever, and fresh fruit-and-vegetable juice is out of this world. The exciting combinations are endless. Will the fun ever stop? Possibly, but not any time soon. As for the juices that we’ve been making, we went a bit overboard at first, but I quickly decided that I don’t like to put too many flavours together – my maximum is four different ingredients. I wasn’t sure which vegetables to combine with which fruits, either, but there’s a very simple golden rule: if it works as a salad, it’ll work as a juice. 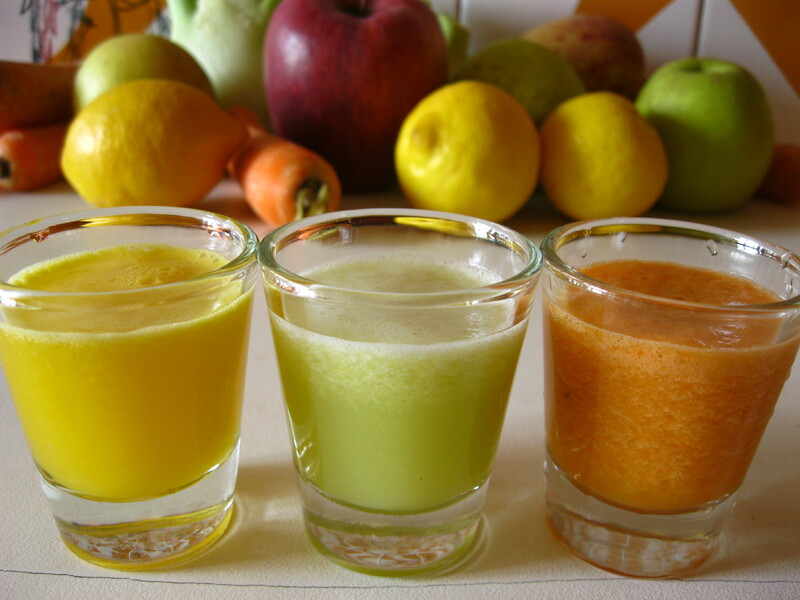 Here are some fruit juices that you can make it you have a juicer, or some salads that you can make if you don’t! That way no one needs to feel excluded. We’ve got orange-fennel-lemon, fennel-apple-lemon, and apple-carrot-lemon. OK go! 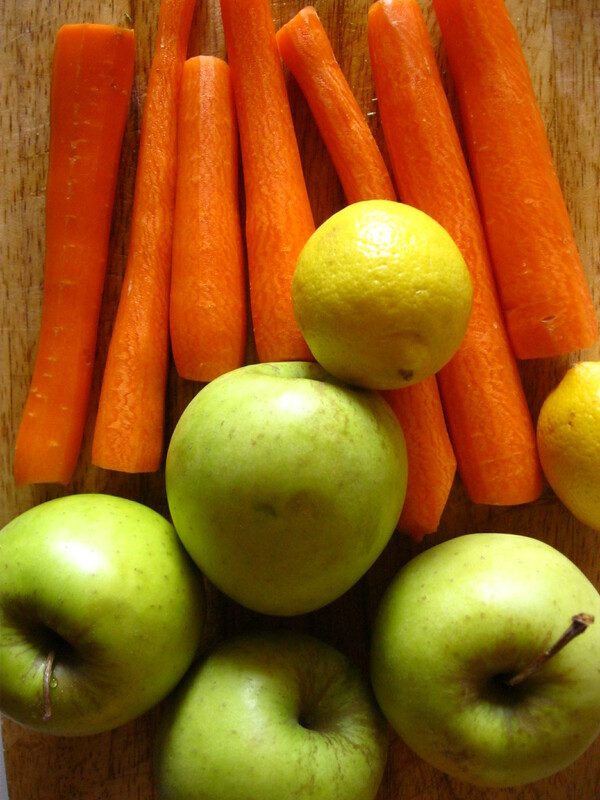 Left to right: orange fennel, fennel apple, apple orange. 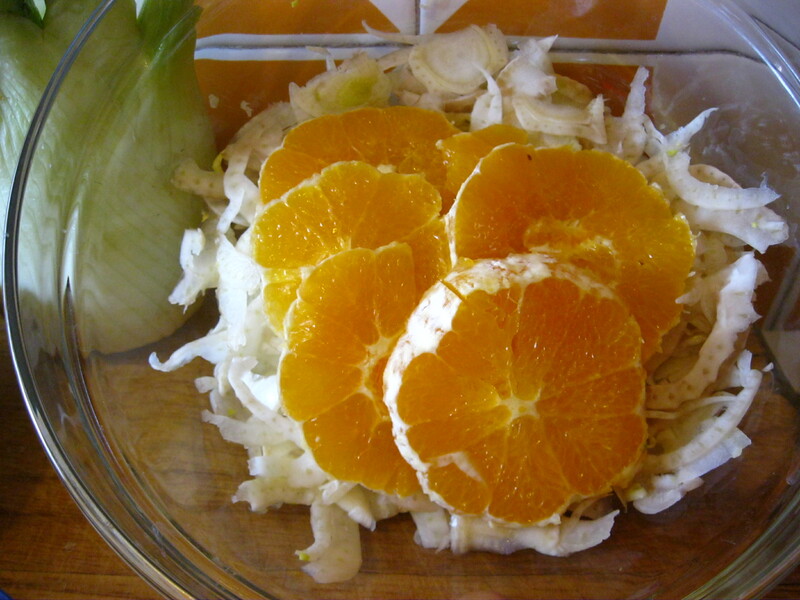 For the salads you will need the same ingredients, but maybe go for one fennel and one orange or apple each, then add the juice of half a (small) lemon. Additionally use some salt and a sprinkle of olive oil. If you have a juicer, you probably already know how this works, but anyway: Cut the leggy bit off your fennels, remove the hard bit in the centre, then chuck them pieces into the juicer. Peel your oranges, add them one by one. Peel your lemon, add it to the juicer, too, and there you go, that’s one juice done. 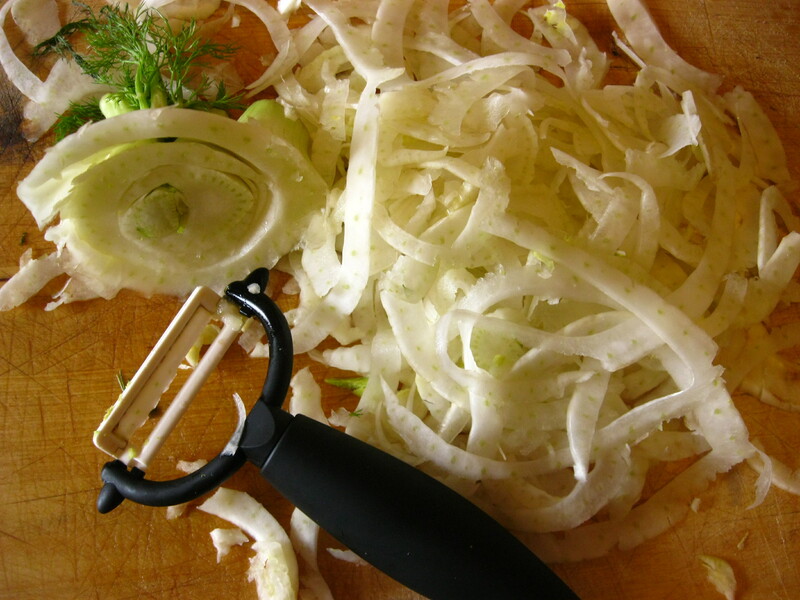 If you’re making salad: cut the hard leggy bits off your fennel, halve it, remove the hard bits, and now grab a cheese slicer or a peeler and cut very thin slices of fennel. Grab an orange, peel it, and slice it into thin slices as well. Dress with some lemon juice, olive oil and a pinch of salt. Next juice! Cut the leggy bits off your fennels, remove the hard bit in the centre, then chuck the pieces into the juicer. Quarter the apples, remove the seeds, and juice them. Peel the lemon, add it to the juicer, and another juice done. If you’re making the salad, go through the same procedure as with the previous one. 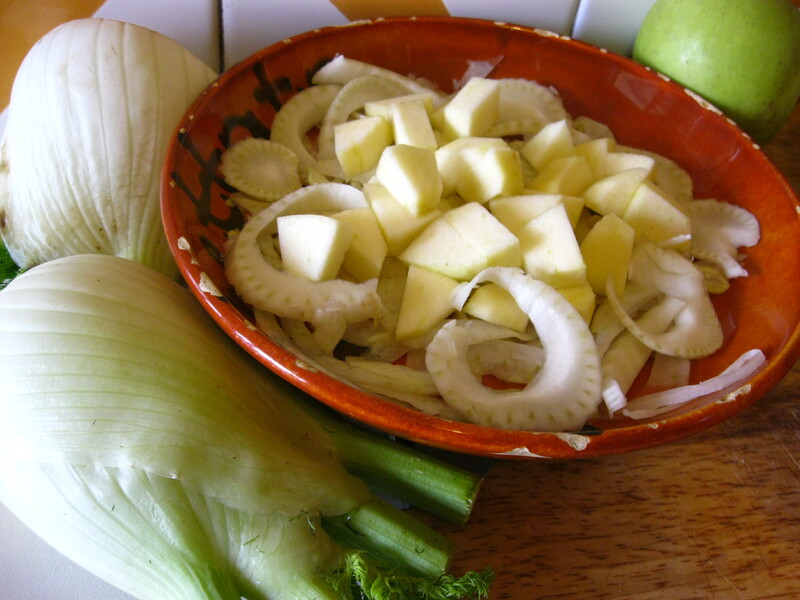 Instead of adding orange, add cubes of apple and dress with lemon, olive oil and salt again. Final juice! Peel your carrots, remove the endy bits and juice those fuckers. Quarter your apples, remove seeds, and juice. Peel your lemon and juice. Done. 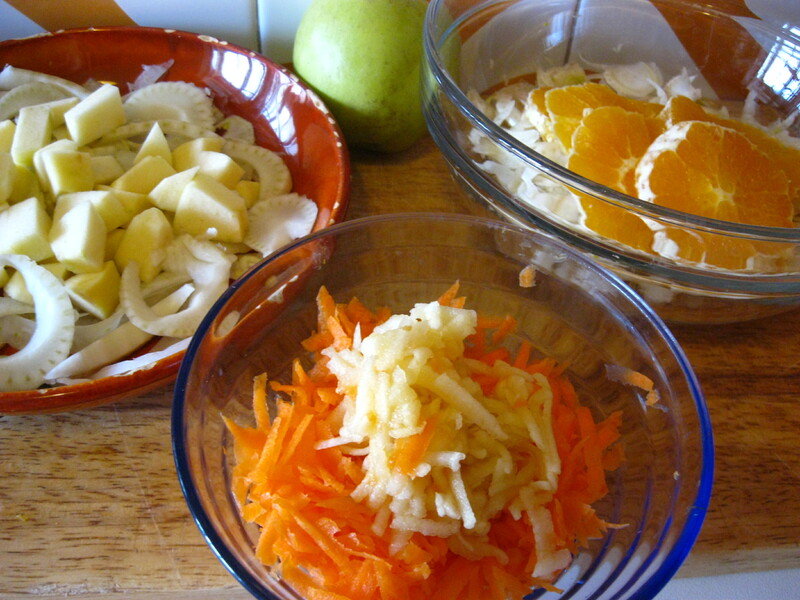 Now if you’re making the salad, this one’s slightly different: grate your carrots, then your apples. As ever, dress with some lemon juice and oil. Alternatively, this one goes really well with yoghurt and parsley instead of oil and lemon. You decide. This entry was posted in Food, recipes, salads, Vegan, Vegetarian and tagged apples, carrots, fennel, fresh juice, fruit, healthy food, juice, juicer, lemon, orange, salad, vegetables. Bookmark the permalink. 1 Response to Wanna hear a juicy story? Wat toevallig. De laatste tijd eet ik ook idioot veel fruit. Wat ik heel lekker vind is een halve appel, halve peer, hele avocado en een schijf mango in onregelmatige dobbelsteemtjes snijden en een klodder Griekse yoghurt erdoorheen. Geen verdere toevoegingen. Heerlijk.